While Staging Diva students know I don’t advocate devoting all your marketing to real estate agents, they are one of our 4 key target markets. 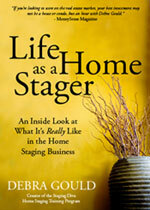 Many of them don’t fully understand what a home stager does and how it can help them. Let’s face it, if real estate agents don’t “get it” they aren’t about to hire us or recommend our home staging services to their clients. Here are my tips for helping change that. In the case of speaking with a Realtor®, if you just say something typical like, “home staging will help this house sell faster and for more money,” you might be met with a blank or skeptical stare. Or your comment might just breeze right by because it sounds almost cliché by now. For example, you can tell his client things that they might not want to. In other words they don’t have to be worried about annoying their client (and risking the listing) by saying things their client won’t want to hear. You can also make his MLS photos look great so that more people will book showings and come to open houses (this will be especially meaningful if you’re having this conversation at a quiet open house that’s eating up his weekend and not generating any qualified leads). As the home stager, you are the independent 3rd party who complements the real estate agent’s services allowing them to focus on what they do best, finding clients and selling real estate. Successful real estate agents meet hundreds of people in any given month and you want them to remember you. Plan on giving the agent your business card and brochure during this conversation. Your brochure should look professional, include quality before and after photos from your home staging portfolio and the address of your home staging website. This will help even the most skeptical agent envision the difference you can make— especially if the agent hasn’t worked with a stager before. By the way, if you’re wondering how to go about getting a brochure and how much it will cost, I personally create a FREE company brochure for Staging Diva Graduates who have profile listings in the Staging Diva Directory of Home Stagers. They all use these when visiting open houses. Many have been Directory members for years rather than taking the time, money and considerable effort required to build their own independent website. If you’d like many more ideas for compelling messages to use when discussing home staging with real estate agents, you’ll find them in course 4, Staging Diva Sales and Marketing Secrets to Boost Your Home Staging Business.